Being an empath is a beautiful gift and a spiritual superpower, although it might not always feel like it. An empath is somebody who is able to feel the emotions, the energy, and even the physical pain of others. They tend to have a heart of gold and a highly developed intuitive sense. This heightened level of sensitivity and perception can make an empath shine as a healer, a counselor, or in any helping profession. Literally feeling what others are experiencing can guide you in how to best assist them. Perhaps that’s why so many people are drawn to empaths! A challenge for empaths is to learn to distinguish which emotions, pains, and thoughts belong to others, and which are their own. Protection is key for empaths to help them avoid becoming overwhelmed and drained. It is also helpful for them to have skills and tools to release negative energy and emotions they may have picked up. As the cosmic and planetary energies continue to intensify, the need for empaths to practice good self-care becomes even more important. Thankfully, there are four powerful crystals that provide perfect support for empaths and sensitive souls. Sugilite is a godsend for sensitives who are on their spiritual path due to its ability to protect, purify, awaken, and ground. It can come in various shades of purple, and some specimens contain spots of black, grey, or white. 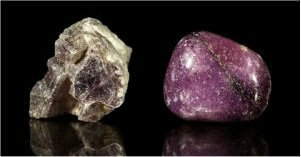 Sugilite is a shielding stone that forms an impermeable bubble of protection around you. Its protective quality keeps you safe from intrusive or disharmonious energy, negative emotions, and lower thought-forms from others or from your environment. It can also block psychic attack and prevent entity attachment. 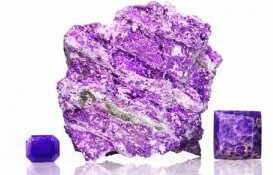 Sugilite brings in the violet fame of purification and helps you to transmute and dispel negative energy, patterns, and karma that might be affecting you–whether it originates from others or from yourself. Perhaps this is why Sugilite is commonly recommended for sensitive souls, children, or starseeds who have difficulty adjusting to the negativity that is prevalent on the Earth plane. Sugilite awakens the higher chakras and keeps your intuition sharply tuned, while also grounding and balancing you. Since it boosts the intuition, it helps empaths to navigate their surroundings and to avoid negative situations and people. It can also help empaths who do healing or metaphysical work to enhance their healing and psychic gifts. The presence of manganese, iron, and lithium gives Sugilite a calming, balancing, and grounding quality that is especially helpful for empaths. Being grounded and centered makes it easier to be aware of your own energy and to detect when you are being affected by outside influences. 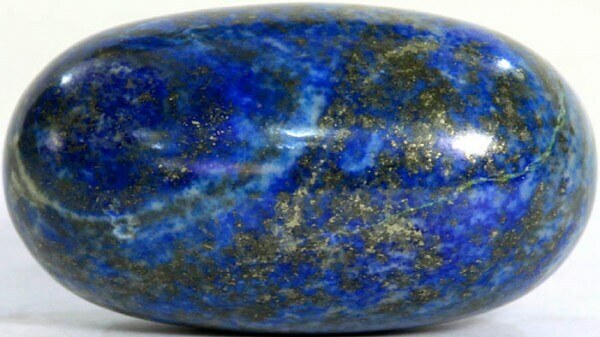 Lapis Lazuli is a beautiful blue stone with inclusions of Pyrite (fool’s gold) and Calcite. Prized by the ancient Egyptians and recognized by Edgar Cayce as the most beneficial stone for humanity, Lapis Lazuli assists with spiritual mastery, higher dimensional attunement, and auric maintenance. Lapis is a highly protective stone that seals, repairs, and strengthens your auric field, while also clearing any negativity that you might have picked up. The Pyrite inclusions ground, balance, and stabilize the entire auric field. Pyrite also blocks lower influences and energies. Some empaths experience energy drain due to a breach in their energy field, and Pyrite can help to replenish the depleted energy. The Calcite inclusions bring a pronounced clearing effect, helping to cleanse and purify the entire bio-system. Calcite also has an amplifying effect that energizes you and increases the power of Lapis Lazuli. For these reasons, Lapis Lazuli is one of the best, most complete protection and energy maintenance stones out there. Lapis Lazuli is a stone of higher connection, wisdom, and truth that can expand your consciousness and tune you into higher levels of guidance. It can help empaths to decipher and trust the subtle intuitive impressions they are getting, while empowering them to act upon the information appropriately. Since empaths can get bombarded by people who need help, Lapis Lazuli is a great choice for helping them to speak up and to set clear boundaries when necessary. A common complaint that empaths have is being anxious and overwhelmed, because they are like antennas that receive vast amounts of feelings and energies that surround them. Lepidolite is a beautiful antidote to the stress, anxiety, fear, and lower emotions from others that can inundate their fields and overwhelm them. Lepidolite is a beautiful stone that is normally in the pink, lavender, or purple spectrum and has a high lithium content. Crystals and stones containing lithium naturally emit a calming energy that can counteract feelings of panic, worry, anxiety, stress, anger, and other uncomfortable emotional states. It feels like a soothing balm that smooths out frazzled nerves and helps you to take a deep breath, relax, and let go. It effectively clears the major and minor chakras, as well as the meridians, of blocked energy, unhealthy emotions, and negative thoughts. Lepidolite has a filtering effect. It helps you to tune out extraneous energies, feelings, and impressions that you don’t need to absorb. It is highly recommended for sensitive people, because it fortifies the emotional body and helps you to be less affected by drama or chaos that might enter into your sphere. It also encourages you to set your own space and to lovingly keep the door closed to energies that would throw you off center. Rainbow Fluorite is a multitasking powerhouse that can help empaths on all levels of the being. Fluorite is one of the magical minerals that can be found in a wide range of colors: pink, magenta, white, purple, blue, green, yellow, red, and black. 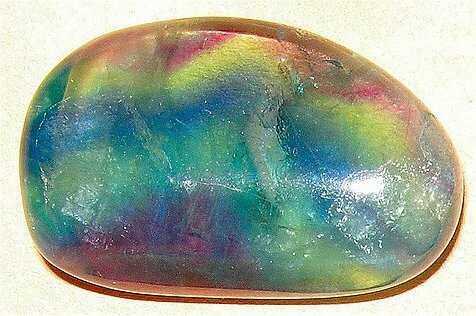 Rainbow Fluorite has multiple colors in one stone. This means that it is equipped to clear and balance multiple chakrassimultaneously. Sacred geometry also plays an important role in the energy of Fluorite. Fluorite naturally forms in the shape of the cube and the octahedron. The cube helps to structure and organize energy, while grounding and protecting you. The octahedron resonates with balance, healing, and spiritual activation. For all of these reasons, Rainbow Fluorite is the stone that keeps your feet anchored to the Earth, all of your chakras open and clear, and your consciousness attuned to the higher dimensions of reality. This is essential for empaths, so that they stay centered, grounded, protected, and tuned-in. Rainbow Fluorite really shines when applied to the higher chakras, because it heightens your psychic ability and intuition. It also sharpens your mental body and can help empaths to understand and process the incoming spiritual information that they are receiving. Known as the IQ stone, it brings order, coherency, and clarity to your thoughts and senses. It has a profound clearing effect, getting rid of mental clutter and general psychic debris from other people that might otherwise lead to confusion. Rainbow Fluorite has a powerful healing influence on the physical body. According to Melody, author of Love is in the Earth, Fluorite purifies, cleanses and eliminates that which is in disorder on a physical body level. Therefore it is a healing support for many diseases, such as colds, flu, infections, and even cancer. For empaths who pick up other people’s physical ailments and pains, Fluorite can help to release and heal them with greater ease and speed. Rainbow Fluorite’s clearing, stabilizing, and protective qualities are also highly beneficial for the emotions and for the aura. It can help to clear emotions and blockages, to stabilize erratic feelings, and to bring you back into a state of emotional balance and calm. Rainbow Fluorite clears negativity from the auric field and protects against EMF’s, lower energies and thought-forms, psychic attack, and other undesirable energies. Being an empath can rock–if you have the right rocks! Allow these four crystals to have your back, while you use your beautiful gifts to help heal people and the planet. Do Vitamins Make You Healthy?